Can someone try to guess the breed of dog that we just got? 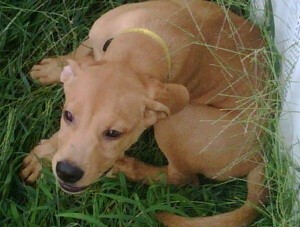 It would be easier to see it standing up but it looks to me to be some type of Cur Dog, maybe a Yellow Blackmouth Cur. What a cutie! Congratulations on your new baby. I think I see some Labrador there. As the previous poster said, it would be easier to see if he/she were standing. Nice Looking pup. My guess would be a golden lab and pit mix. Cute pup! Looks like a cross between a pit and a hound? Very cute puppy. Looks like it could be a pit bull and a lab because I have never seen a golden pit before but its very cute.